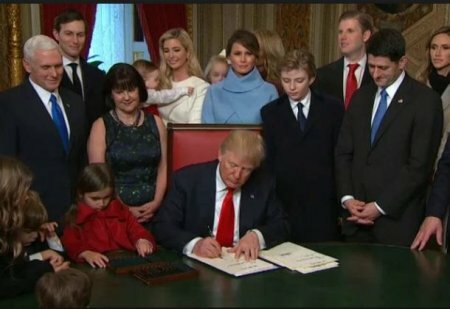 President Donald Trump signed his first bill into law Friday, moments after being sworn in, clearing the way for his defense secretary to be confirmed. The 45th President signed a bill passed by Congress earlier this month that would allow retired Gen. James Mattis to serve as defense secretary by waiving the legal requirement that he be out of the military for seven years before doing so, according to White House press secretary Sean Spicer. Mattis will still need to be confirmed by the Senate, which is expected Friday afternoon. Cameras rolled as Trump signed his first orders as President in the Capitol, surrounded by congressional leaders.